Pachoru is an ancient Christian delicacy. It is usually made during Church Festivals. In olden days, when one’s wishes come true, people used to make Pachoru and take it to the church and distribute it to the devotees, on the festival day. It is served with melted jaggery and can be eaten as a snack or a dessert. Kids will love it too! Velankanni is a famous pilgrim centre in Tamil Nadu. The church is dedicated to Our Lady of Health. It is one of the most visited pilgrim places in India. The festival is celebrated on September 8th every year. 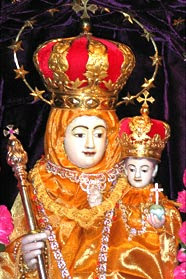 Mother Mary is lovingly known as ‘Annai Velankanni’ throughout Tamil Nadu. You can read more about Velankanni here. Cook the rice along with 4 cups of water in a pressure cooker for 7 minutes. Grind the coconut to a fine paste. Open the cooker and add the ground coconut paste, salt and 2 cups of water. Mix well and simmer it for about 5 minutes till it is thick. Finally add crushed cumin seeds and mix well. Transfer it to a serving dish and let it cool. Cut it into pieces and serve topped with melted jaggery. It can be served chilled or at room temperature. Sounds delicious…! 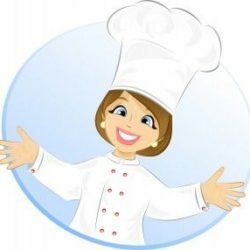 !Thanx for the recipe..! looks and sounds delicious, I can almost smell the coconutty aroma. What an amazing entry lissie? i heard a lot about Velankanni from friends n family but never went there and also i never knew about this dish till now!! So I came over!! So how did u celebrate this festival dear …? Never heard of this before, sounds incredible and yeah I agree with Saju! Dessert looks so good, lot of coconut.YUM!! This is a totally new dish to me. I’ve never heard of this before. Looks so nice. will try it for my son. Thanks for sharing. I used to have this in KTM…and used to love Pachoru! !Thanks for sharing this christian authentic,Lizzie!! thank you raks, padmaja and padma for your kind words! sirisha, you missed a golden opportunity. never mind, try to visit Velankanni next time you come to India. i used to visit Velankanni every year with family. apple, it is a sweet dish. cumin is added only for flavouring just like we add cardamom. it will not be savoury. thankx for visiting! thank you asha, kribha and bharathy for your compliments! rina, it is a new information. thanks! I was thinking what would be the taste of thsi rice, jeera plus jaggery..? umm, like neyyappams? Is this like a rice pudding. thanks prajusha and viji for visiting! viji, nice to hear that you have visited Velankanni!! seena, it won’t taste like neyyappam. it would have the taste of your jeera kanji with some jaggery added! cynthia, it is ofcourse a rice pudding! you said it correctly!! it is a wrong reciepe jaggery should be added in the process of cooking itself .you prepared what is called vembachoru. Sini, thanks for visiting my blog! I have not posted a wrong recipe for ‘pachoru’ here. There are two ways of preparing ‘pachoru’. One method is to add the jaggery while cooking and the second method is to serve the jaggery separately with the ‘pachoru’. In my childhood days, I have eaten both these types of ‘pachoru’ any number of times…and noted that it tastes better when served topped with melted jaggery! Even my children prefer it this way …! ‘Vembachoru’ I think is actually ‘Ven Pachoru’ which means ‘Pachoru’ which is white in color! Hope I cleared the misunderstanding..
hey lissie ,thanx for this wonderful recipe which i used to enjoy in my childhood . made it today and came out very well and you’r right it is tastier when jaggery syrup is drizzled on top of the pachoru .